PHOTO PROVIDED "Cave," a silver gelatin print by Sean McFarland, is part of the "Glass Mountains" work-in-progress exhibit at Visual Studies Workshop's Project Space. You could spend your life in pursuit of genuine wilderness, without the promise that you'll ever actually experience it. The buffer between humans and the rest of the natural world is, if incomplete, fairly ubiquitous, even when we don't detect it at first. The revelation of this illusion is what kicked off "Glass Mountains," Sean McFarland's in-progress body of work currently evolving in the Project Space at Visual Studies Workshop. It all started with a waterfall in Golden Gate Park. "It was twilight, and I was photographing this waterfall -- it was really beautiful," McFarland says. "I had to change the film back on my camera, so I took it off, removed the film, rewound it, and when I looked into the ground glass, the waterfall had disappeared." Because somebody had turned it off. "Obviously, I'm not standing in a natural world," he says. "But that disconnect was insane, because it's like, water, gravity, and the weather -- those things aren't supposed to just completely change in a second." He began to see national parks as not different from, but analogous to, museum dioramas. McFarland is a visiting professor of photographic arts and sciences at RIT, and moved to Rochester from his native California in August. His work reflects his interests in our concept of wilderness, the impossibility of wilderness, and the slippery nature of language. Though the title of this body of work, "Glass Mountains," is taken from an actual geographic place in the eastern Sierra Nevada Mountains, and other spaces around the world with the same name, the focus is not site-specific. The project explores the idea of the natural world, everywhere, and our relationship to it. "Some of the core ideas from the project are looking at the way 19th century landscape photography mythologized the landscape; sort of turned it into this series of tropes," he says. "I think it also really fetishizes it." McFarland says he is also interested in "how far apart experience and record sit, like when you go see something and photograph it, and bring it back, they're completely irreconcilable." In addition to photographing experiences of artifice, he employs many methods of subtle artifice in his work. At times, McFarland creates spaces that aren't real, and photographs them in ways that elevate the illusion to reality. In other cases, he photographs reality, but manipulates our impression of what we're seeing. One work, "July 25, 2013," is a series of three stills from a video taken on the titular day. "I was working with a trail crew in the eastern Sierra Nevada, and there was a lightning storm over the Mono-Inyo Craters," he says. Taking a video from the truck as it rolled along, McFarland captured a lightning bolt. "I decided to show it as this kind of traditional, factual representation of photographic information, which is a contact sheet," he says. But this particular contact sheet, of a captured flash of sky voltage, is a deliberate misrepresentation of reality. "No one can photograph that quickly in succession, it's impossible." McFarland's fake-nighttime photographs of scenes in San Francisco's Golden Gate Park were created by underexposing an image during the daytime. 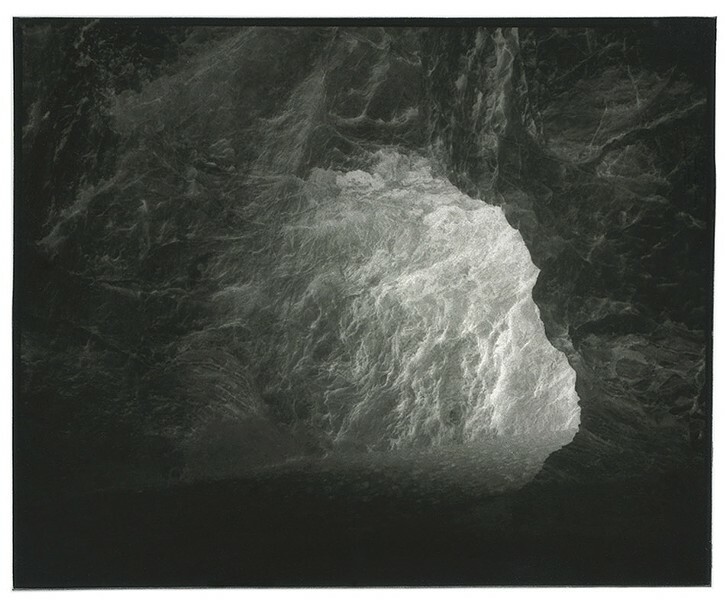 Another image, "Cave," was made by photographing the mouth of the cavern from the outside, standing in the sunlight, but the image was printed as a negative. "Instead of the opening swallowing light, it now becomes a source of illumination, moving us inside the cave, looking out, as opposed to outside looking in," he says. The Project Space's walls are filled with a shifting series of McFarland's digital photographs, cyanotypes, Polaroid photographs, inkjet prints on newsprint, silver gelatin prints, collages, drawings, and objects. Vitrines in the center of the room are filled with more objects and images. Photosensitive paper, with rough-edged chunks of glass set on them, will develop images of unreal mountains over time. "Normally, I make stuff that's really polished, and this is bonkers fun to make something that's not necessarily so direct," he says. McFarland is in the space regularly, tweaking and changing things, putting the process of discovery and evolution of the project on display. "It's just like having a public studio. Which is a little nerve wracking, but at the same time, kinda great," he says. The Project Space functions as one part studio, one part gallery, where artists can hear feedback, try out different display techniques, and preview how people interact with installations. "One issue I've been having with my work is that I think it can be really opaque, because I do go through a lot of processes to create artifice," McFarland says. "And so with this show, what I'm attempting to do is reveal that process of the manufacturing of the artifice, to get people to further question what they're looking at, or question their relationship to the landscape." McFarland's is the fourth of seven projects in the current cycle of month-long residencies in the Project Space. The previous work-in-progress was "Wall + Paper" by Evelyne Leblanc-Roberge, whose work documented her correspondence with prisoners regarding the spaces in which they live versus the spaces they dream about, crafting a dialog about the politics of space and time. Visual Studies Workshop director, Tate Shaw, says the aim is for artists to use the space as a way to try something they've never tried before, or develop a project further, but not to necessarily see it as a finished thing. "It's for artists to make things, and for us to have a dialog about them and the process of their making," he says. Visual Studies Workshop will soon accept proposals for the next cycle of Project Space residencies. Check the website for more information. An artist talk with McFarland will be held Wednesday, March 4, at 6 p.m. The show's closing reception will take place Friday, March 6, from 6 to 11 p.m.